Annie is also struggling to find her way romantically, but is stuck in a perpetual booty-call rut with a pretty face and no personality. That is until she’s pulled over by state patrolman Rhodes, (Chris O’Dowd) for driving erratically with no tail-lights. She sob-stories her way out of a ticket and the seed is sown. Whenever I try to find an adjective for their relationship, the word I keep coming back to is charming. Wiig and O’Dowd are very charming, and not “gorgeous” by Hollywood standards, but their banter is playful and believable which is something that is usually absent from romantic-comedies. Director Paul Feig does a good job of intertwining the budding romance with the rivalry of Annie and Helen. There’s a nice balance and though we can see Annie’s breakdown coming, it’s earned, and as far as meltdowns go, the bridal shower scene is one of my all-time favorites. I did have some problems with the film though. It’s a perfect example of what is wrong with Hollywood. I imagine the original script was charming, peppered with clever dialogue and heartfelt moments, propelled by strong female characters. Somewhere along the way, the marketing geniuses decided it just wasn’t broad enough, so they dropped in a gratuitous scene of full-contact puking and shitting-in-the street jokes, as well as some secondary characters who say off-the-wall and outrageous things. This is surely meant to draw in a more masculine audience. The sad thing is that none of those things are needed. The story is good on its own. The main characters are fully recognized and acted superbly by Wiig, Rudolph, Byrne and O’Dowd. 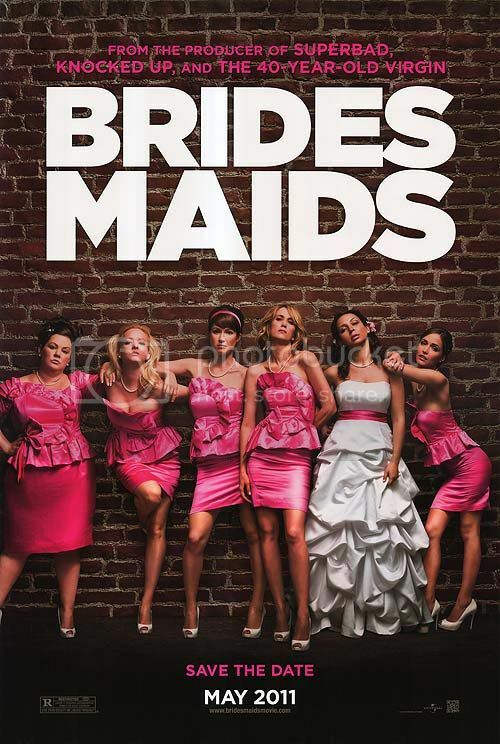 I’ve seen BRIDESMAIDS touted as “THE HANGOVER with chicks”, but it’s not, and really, it doesn’t need to be, because it’s good on its own merits. It’s a film about a woman struggling to overcome the same speed-bumps in life that everyone endures while still trying to maintain the relationships that make her life worthwhile.